In the Philippines, these ferns are called ‘pako’ or ‘paco’ and ‘pijai’ or it depends on which part in the islands you’re in. If you’re in the north, it’s most probably ‘paco’ and it’s ‘pijai’ in the south. This kind of ferns are packed with nutrients such as Vitamin B, A, iron, calcium and phosphorus. They grow in the grasslands and in moist and cool areas. It is abundant in the province where I grew up but since they are common to us, we seldom eat or just ignored them. 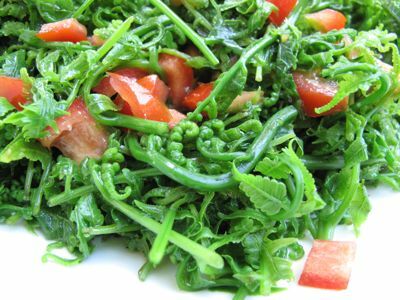 However, there were times we craved for fern salad, so we prepare one that looked the same as the photo below. We only use the young sprout and leaves then throw away the firm stalk because the stalks are not tasty at all.